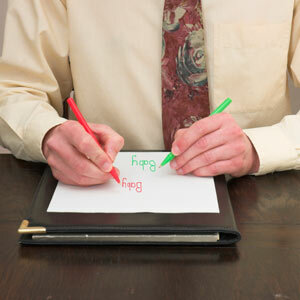 Handedness may be linked to fertility a new study suggests. People who are "mixed-handed," those who are able to use both hands with equal dexterity, may have harder time having a child than righties or lefties, a new study suggests. Researchers found that among more than 9 000 Danish couples, those in which one partner was mixed-handed, rather than exclusively right- or left-handed, tended to take slightly longer to conceive. The findings suggest that mixed-handedness and lower fertility may share a common cause, according to lead researcher Dr. Jinliang Zhu, of the University of Aarhus in Denmark. It's possible, for example, that hormonal exposure during prenatal development affects both a person's eventual handedness and his or her fertility, Zhu said. That, however, remains to be proven, the researchers point out in the medical journal Epidemiology. A number of studies have looked at the connection between handedness and health. Some have linked being left-handed or mixed-handed to having a higher risk of some diseases and disorders, including breast cancer, schizophrenia, dyslexia and autism. One theory is that those who are not right-handed had some type of exposure that interfered with brain development in the womb, such as abnormal hormonal levels. In the current study, Zhu's team found that mixed-handedness in both men and women was related to a longer time to conceive. While that raises the possibility of the two having a common cause, other explanations are also possible, Zhu noted. It's not clear that mixed-handedness is a signal that something "went wrong" during a person's foetal development. "So far we know little about the (origins) of handedness," Zhu said. "At this time, it is difficult to say that mixed-handedness is pathological."